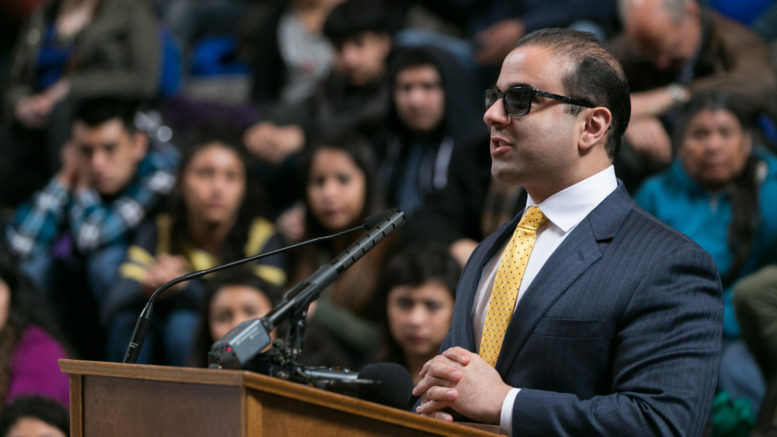 This post is a replication in part of a newsletter from Lieutenant Governor Cyrus Habib. To subscribe to his mailing list and receive these newsletters, you can follow the link here. Shortly after taking office, I learned that Congressional budget cuts and policy changes were expected to leave approximately 15,000 high-achieving, low-income students without a way to pay for their Advanced Placement (AP) and International Baccalaureate (IB) exams and earn college credit. I found that unacceptable. In response, I partnered with the Office of Superintendent of Public Instruction (OSPI) and generous donors to create the AP Access Fund, a public-private partnership to raise funds so that every student receiving free or reduced cost lunch can take AP and IB exams for free. Yesterday, I joined OSPI in announcing that the AP Access Fund reached its goal! Thanks to the generosity of Microsoft, the Schultz Family Foundation, Boeing, and nearly a dozen other donors, and with the support of Superintendent Chris Reykdal, the College Success Foundation, and Challenge Seattle, we are now able to dedicate nearly a million dollars of public and private money to guarantee access to college credits for each of these 15,000 hard-working students! Read more about the initiative and the initial challenge in the Seattle Times and Education Week. One of my roles as Lieutenant Governor is chairing the Legislative Committee on Economic Development and International Relations. My office has been meeting with community and industry leaders and responding to the economic needs of the state. In my first month in office, I spoke with the CleanTech Alliance about the importance of developing the economy with a commitment to clean energy. I joined the administrator of the Bonneville Power Authority to emphasize Washington state’s role as a leader in clean energy, creating a greener, more prosperous Washington for all. At the Capitol, I met with the Washington Maritime Federation and the Washington Public Ports Association during their annual Maritime Day. I took time to emphasize the importance of trade to Washington state’s economy and my office’s commitment to enhancing trade opportunities for all Washington businesses. In February, I met with the Tri-Cities Legislative Council, discussing increased access to higher education opportunities in the state, as well as ways to keep up with the growing economy by providing more workforce training opportunities. I also met with the Washington Retail Association to discuss their needs, increasing tourism within the state, and their efforts to employ veterans and people with disabilities. Most recently, I spoke to the Aerospace Futures Alliance and the Washington Aerospace Partnership in a room filled with members from companies that included Alaska Airlines, Blue Origin, Boeing, and Mitsubishi—companies known internationally for their innovation. I discussed expanding workforce training opportunities and the importance of looking beyond Washington’s borders for effective trade partnerships, which will help our economy adapt to an increasingly automated world. I look forward to building on these early economic development meetings after the legislative session is over by traveling and leading trade missions to grow Washington’s economy. As an individual with a disability and a proud Washingtonian, I’m passionate about expanding access to workforce training and employment opportunities for returning service members and people with disabilities. Shortly after taking office, I began meeting with a number of different community organizations and business groups to discuss enhancing vocational training and education possibilities for all returning service members. In late January, I met with Leadership Clark County to discuss sustainable leadership and increasing access to employment and workforce training for veterans and people with disabilities. The topic struck a chord with the audience, some of whom were veterans themselves. A week later, I spoke at the Washington state launch of Operation Family Caregiver in Bellevue in support of programs that help our veterans transition to civilian life. I also spoke yesterday at the launch of WAServes, the eighth regional network in the country and a collaboration between the Schultz Family Foundation and the Institute for Veterans and Military Families, aimed at improving quality of care and access to critical services for service members, veterans, and their families. Earlier this month, I also introduced legislation that expands the mission of the Association of Washington Generals, a public-private service organization created by Lt. Governor John Cherberg 40 years ago, to include expanding educational and employment services to youth, veterans, uniformed service members, military families, and people with disabilities in Washington state. The bill has since passed out of the House State Government, Elections and Informational Technology Committee and is slated to be considered on the House floor. Early in my term as Lieutenant Governor, President Donald Trump issued an executive order temporarily blocking citizens of seven predominantly Muslim countries from entering the U.S. As an Iranian-American and the child of immigrants, I was deeply concerned, and immediately joined Gov. Jay Inslee, Attorney General Bob Ferguson and other Washington state elected officials in publicly condemning the executive order, speaking out at an emergency press conference at Sea-Tac airport and a rally at Westlake Center, in addition to writing a Washington Post op-ed. I also committed resources in my office, including an online support portal, to help people affected by the ban. I’m proud of Attorney General Ferguson’s work on our state’s successful lawsuit to stop the order, and will work with him and Governor Inslee to uphold Washington state’s commitment to inclusion and tolerance. Under the Washington State Constitution, the Lieutenant Governor is President of the Senate. In this capacity, I preside over the Senate, calling for votes, officiating proceedings, and making rulings on procedural matters. Because I am blind, presiding over the Senate presented some technical challenges. Typically, Senators raise their hands to be recognized during a floor session. Aware that an exclusively visual method or recognizing Senators would not logistically work for me in my new role, I worked with the Senate to bring innovative technology to the chamber. Now, as highlighted in the Associated Press, Seattle Times, and KIRO News, Senators press a button that allows me to read their name in Braille at the rostrum when they want to be recognized. It’s been exciting to show that, with creative solutions, anything is possible. I’ve used my time as President of the Senate to focus on the functionality of the legislative body. As I discussed in my TVW interview with Austin Jenkins, I’m particularly passionate about the importance of parliamentary procedure, in addition to conducting my job in a fair way and adhering to the Constitution. For more information on our first 50 days in office and developing events and initiatives, please visit my recently revamped website and social media platforms—we’re on Facebook, Twitter, and Instagram. It is a tremendous honor representing you as Lieutenant Governor! Please reach out to my office with any comments, concerns, or questions, and feel free to stop by when visiting the Capitol.